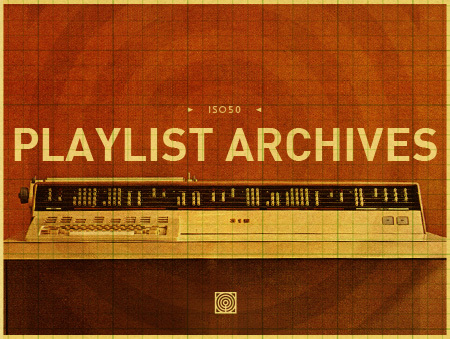 It’s been a long time coming, but the ISO50 Playlist Archive is finally open. There you will find all past playlists archived for your listening pleasure. Just click the “Play” button and the playlist will load into the player (top of page — RSS readers must visit site to listen). It took a lot of code wrangliing and hacking to get this to work so let me know if you encounter any issues. Enjoy! On a side note, I’m scheduling this post to go live after I leave on vacation so hopefully everything is working when you read this. We’ve been having some issues with the site lately so if you get an error just try again a little later. Hello Scott, are there ways to embed your playlists on our blogs? Are these songs on the Ghostly Int. app? I have that, btw, its wicked. Do you know a mood, to get the archives “” playlist? Love the poster! What machine is that? As far as the playlists go, wouldn’t it be easier to just incorperate buttons into the flash player at the top with the numbers of the playlists?